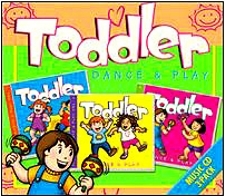 Learning and play go hand in hand with this 3 CD collection of 75 of the most popular songs for kids! Toddlers will giggle, wiggle and sing along while learning the alphabet and letter sounds, simple counting, shapes, days of the week, manners and much more! They'll play Simon Says and Duck Duck Goose with their friends. Or just laugh together with the silly, nonsense songs like Apples and Bananas, The Bear Went Over The Mountain and The Green Grass Grew all Arond! Do You Know What Has a Trunk? Can You Swing Your Arms? My kiddos loved these! They're great!